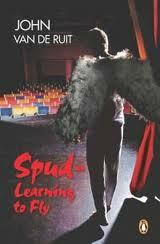 If you haven’t yet heard of the Spud books, never mind read them, then you are missing out on a seriously funny series. If you were like me, thinking, nah, the series isn’t for me, I am not really interested in a ‘boys boarding school’ book then you would be (mostly) wrong. If you don’t believe me, ask your friends if they have read it…! I thoroughly enjoyed these books, but really only got into them when a friend of mine had borrowed her brothers copy, read it and then passed it onto me as I really thought I wouldn’t enjoy it. I could not put it down, and then went and found the second one from the library and bought the third and fourth one. Luckily for me, I only read them all a few months ago, so I didn’t have too long a wait for the final installment, which was great for me, not so great for everyone else who has been waiting with eager anticipation for the final book. Which let me tell you, does not disappoint! It’s South Africa, 1990. The country still squirms under the iron fist of apartheid. Two major events are about to happen: The release of Nelson Mandela, and more importantly, it’s Spud Milton’s first year at an elite boys only private boarding school. Cursed with parents from well beyond the lunatic fringe, a senile granny, and a dormitory full of strange characters, Spud has to forge a new life for himself in this foreign and sometimes hostile environment. Surrounded by names such as Gecko, Rambo, Rain Man and Mad Dog, Spud takes his first tentative steps along the path towards manhood. (The path, it seems, could be a rather long road.) Armed with only his wits and his diary, Spud takes us from illegal nightswimming to the cricket field, from ghostbusting to teacher baiting. He also invites us into the mind of a boy struggling to come to terms with a strange new world; a boy whose eyes are being opened to love, friendship and complete insanity. And thats just the first one…. Truly is a delightful series of books, moving and funny, well, hilarious in parts, and completely true to life, loved it! 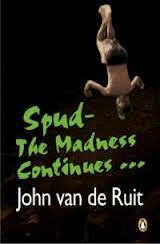 And if you have read them, have you perused John van der Ruit’s blog? Go here if you haven’t, quite delightful! 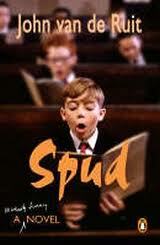 Goodness me I lOVED Spud. So funny! I watched the movie too and I must say that it was really good – and I don’t easily say that about movies if I’ve read the book. I think that the latest one is about to be released or maybe it has just been released. Must check. 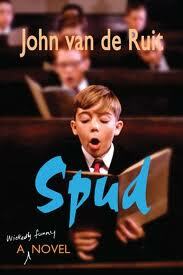 Was cleaning out my bookshelf the other day and came across my Spud books which I’ve now given to my 12-year old. He’s currently busy with another series (Wimpy Kid or something like that) and I think he’s going to LOVE it. Will check out the authors blog. Thanks for that link. I looove them. Introduced my dad to them via audiobook (he’s visually impaired) and he looooves them to bits.